THE LOSS OF THE GANGES OFF THE COPE of GOOD HOPE. On her return voyage from Bengal the Ganges joined the convoy off Point de Galle on the southern tip of Ceylon, on Wednesday 25th March 1807. By Wednesday 20th May 1807 off the Cape of Good Hope, she was taking in 14in of water per hour. By Wednesday 27th May the ingress of water had increased considerably and in danger of foundering and was being watched over by the Earl St Vincent, herself in a leaky state. On Thursday 28th the crew and passengers were safely transferred to the Earl St Vincent. She sank beneath the waves on the morning of the 29th. Her crew and passengers were landed at St Helena and dispersed amongst the other ships in the convoy for their return to England. The Journal & Log &c. have been transcribed and are elsewhere on this Website. The Ganges was built by Wells and launched 1797. Length 181ft, 1502 tons. Four voyages to the Far East are recorded by Farrington this was her last, her commander was Captain Thomas Talbot Harington. Her Log Books for this voyage were deposited at India House. In 1804 she had been involved in the Battle of Pulo Aura. See The Ganges, East Indiaman by W. J. Huggins, in Bulletin of the Victoria Memorial Calcutta, 8 (1974) pp.21-23, illus. See also Wikipedia for an account of the battle. 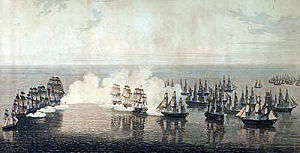 French fleet on the left, British fleet on the right with Commadore Dance's Indiamen, including the Ganges, in the centre. Thomas Talbot Harington, was born in the parish of St Edmund, New Sarum on the 19th September 1780, son of (Rev) John and Rachel née Hawes. He was midshipman Manship (1) 1793/4; midshipman Canton 1795/6; 4th mate Rose (2) 1798/9; 2nd mate Duke of Buccleugh (1) 1800/1; 2nd mate Dorsetshire 1802/3; Captain Ganges (3) 1804/5; Captain Charles Grant 1810; Captain Scaleby Castle 1810/1 & 1813/4. He was then dismissed for non attendance. Captain Harington married twice and by his first wife he was father of William Davenport Harington and Jemima Davenport Harington. He lived and traded for a while in South Africa, in Simon's Town, Cape of Good Hope. He was declared bankrupt in 1829. He then moved to Calcutta, probably in 1830, where he married his second wife in 1831 and died in 1841. See Wikitree for a detailed biography of him. The Ganges' previous log to China is dated March 1803 to October 1804, under Captain William Moffat, the owner of the Ganges and brother in law to Captain Harington. It was under Captain Moffat that she was involved in the Battle of Aura. Captain Harington started his log for a journey from England to China on 14th January 1805 and was returning to England when she sank. Crew: Mr J J James, 4th mate. Landed September 6th at Deal. John Jones James, was bap Rhyayader, Radnor, son of John & Jane. In her majesty's Ordnance Service 5 years; 6th mate Coutts 1802/3; 4th mate Ganges 104/5; 2nd mate Harriet (3) 1807/8; 1st mate Harriet (3) 1809/10 & 1811/12. Soldiers: Detachment 77th Regiment rec'd from the Ganges 28th May 1807. Sergt Francis Cripps, Corporal John Thompson, Corporal Nathaniel James, Corporal John Cornish, Corporal John Poole, Corporal William Burrows, Corporal James Quin, Corporal George McCruken, Corporal Matthew Buck, Corporal James Brooks, Corporal John Bond, Corporal John Dalton, Corporal Joseph Hall, Corporal William Joyce, Corporal William Lear, Corporal Robert McCruchen, Corporal Michael O'Reilly, Corporal John Piggot, Corporal Samuel Sly. Two women and a child: Mary Unwin, Lucy Dalton and John Cripps 4 years. Landed Gravesend September 10 1807. Transcript of the Ganges Report by Captain Harington. The Morning Post (London, England), Monday, August 24, 1807; Issue 11394. British Library Norwich, Sept. 16, 1807. Ship News Official Account of the Loss of the Ganges. To the Worshipful Robert Patton, Governor, &c. &c.
"Sir, I perform a painful duty, in acquainting you with the total loss of the Hon. Company's ship Ganges lately under my command, on Friday, the 29th ult. off the Cape of Good Hope, in lat. 38. 22. S. and long. 19. 50. E. of Greenwich; the particulars of which are faithfully and carefully stated in an extract from her log-book, which I have the honour to include herewith. The ship had been in a leaky state for some time previous to this melancholy event; indeed, much so, as to render it indispensably necessary that she should proceed under easy sail, and that the most prudent and cautious measures should be adopted by my Officers and self in the conduct of her. On the 21st ult. it was my misfortune to separate, in a gale of wind, from his Majesty's ship Concorde, and the Hon, Company's ships, viz. Bengal, Lady Jane Dundas, Atlas, Walthamstow, and Alexander; and next morning, the Hon. Company's ship St. Vincent only being in sight, I placed myself under the orders of Captain Jones, who, with the most watchful and unceasing care, continued to keep as near the Ganges, as circumstances would permit, from that time till the day on which she foundered. You will participate in the satisfaction I feel in being able to acquaint you, that not a single life had been lost, in this ill-fated ship, though not less than two hundred and nine persons were on board but a few hours before she sank; and, from the state of the weather, it will be easy for you to imagine with what peculiar circumstances of difficulty and danger her boats were hoisted out, and so miraculous as well as so general a preservation effected. To Captain Jones, of the St. Vincent, who under Providence, has been the happy instrument of our deliverance, his own feelings must have proved at the time, and will ever prove, through life, to him sources of higher satisfaction than any praise of mine can bestow; but I should ill discharge those duties which my present situation calls upon me to fulfil, if I did not express to you in this public manner, the strong and grateful sense which is entertained by my passengers, Officers, and self, of his humane and generous conduct, both previous to and on the occasion of the loss of the Ganges, as also of his liberal and hospitable attentions to us on board the St. Vincent subsequent to that misfortune. I have the honour to enclose a correct list of all who were on board the Ganges before it took place. Of my Officers, I cannot, perhaps, speak in terms more adequate to their deserts, or more satisfactory to themselves, than by saying they discharged their several duties in the most exemplary manner; and with respect to the ship's company, among whom must be classed a number of men of his Majesty's 77th regiment, working their passage home in her, I feel most happy in testifying that they united all the good qualities of British seamen and British soldiers, when placed together in scenes of danger and distress, till they could no longer be of service to the cause in which they were engaged. I have the honour to be, Sir, your most obedient humble servant, (Signed) T. Harington. "Hon. Company's ship Earl St. Vincent, 15th June, 1807." Extract from the Log-Book of the Ship Ganges, Friday, May 29th, 1807. "Light airs and cloudy in 12. M. A.M. a light breeze and fair, the swell much gone down, but the ship still rolling dreadfully, and rendering it dangerous for the boats to take persons on board, whether astern or alongside. At a quarter past noon the St. Vincent being still nearly four miles from us, there being seven feet water in the well, the stern-post being now four inches off the dead wood, and the ship ungovernable by the helm; got the launch at all risks alongside, having in vain attempted to put the ladies on board of her, out of the stern gallery, though the railing was cut away for the purpose. At three quarters past noon she left us with all the passengers, except Mr. Rolleston, of the Bombay Civil Establishment, who insisted, in a manner the most friendly to me, and the most honourable to himself, on remaining on board until my Officers and self quitted the ship. At one P.M. the yawl left us, with the sick people, and some of the other ship's company and soldiers of his Majesty's 77th regiment. The men still kept working at the pumps with unabated rigour and good-will. At three P.M. eight feet water in the well, and the ship settling fast. At half past four nine feet water in the well, and seeing the launch on her return, called the people up from the pumps. Down both cutters, and sent these off as fast as prudence would permit, with orders put to return. At five, the launch, yawl, and one of the St. Vincent's boat came alongside, and by half past five had all left the ship, again full of people, the Third and Fifth Officers in charge of the launch and yawl. I, immediately after the boats had quitted us, mustered the people, and there being 49 men still on board, (Mr. Rolleston, the Chief, Fourth and Sixth Officer, and myself included) again set the pumps to work, as the night was closing in fast, and the St. Vincent still at some distance from us. At six P.M. in company with the Chief Officers, gunner and carpenter, visited the gun-room for the last time, found the head of the stern-post had forsaken the transom full six inches, the garboard seam of the counter two inches open for six or seven feet down at least, the wood-ends five inches off the stern-posts, and all the counter-timber gone at the heels. At half-past eight P.M. the St. Vincent's boat and yawl once more came alongside, and then (and not till then) were the pumps finally quitted by my orders. Filled the two boats, and dispatched them to return no more; five miutes afterwards, the launch came back to us, and, at three quarters past eight, accomponied by Mr. Rolleston, the Chief, Fourth and Sixth Officers, and all that remained of the ship's company, I quitted the unfortunate Ganges, with three cheers from us all, and twenty minutes after boarded the St. Vincent in safety; where we were received by Captain Jones with all that feeling and humanity which has distinguished his conduct since our separation from the fleet; and here, before the journal of this eventful voyage is finally closed, I conceive it to be my duty to state, that on leaving the ship she had ten feet water in the well, that she had settled half way up her bends, that she was wholly ungovernable by the helm, that the poop, quarter-deck, and upper-works generally were in motion, and that as no human means were left untried, so were no human powers equal to save her from destruction, &c. &c. (Signed) "T. Harington." C&D S72E 40. Strong gales with frequent hard squalls and a large Sea. From 2 to 5pm several signals from the Ganges she being about 4 miles ahead we could only make out one of them expressing her very distressing situation. We could not give her any Assistance as we were laying to under close reefed Main topsail blowing very hard with frequent sudden squalls, continued to burn blue lights throughout the night which we answered and kept as near her as our situation could admit. At daylight she bore SEbS about 4 miles we discovered she had a signal of distress flying at her Main top Mast head, with a continual firing of Guns. We immediately bore down to her under all possible sail. At 9am she made signal per Telegraph �The Ship is sinking send boats immediately�. The swell too great at the time to hoist out the boats: but it soon after subsiding the only Boat we had was hoisted out and sailed to her. The wind being light and variable we were unable to get near her before Noon, when she bore SSEbS 2 miles. Lat 37.41S Long ----. C&D S58E 9. Light airs variable and very fine weather. At half past 1pm the launch from the Ganges came alongside with all the Passengers and several other Persons. Rec�d them all on board and sent the Boat back again immediately accompanied by our Boat. The boats continued to pass to and from the Ship until every individual belonging to her was got on board us. Captain Harington came on board in the last boat at 9pm and informed me when he quitted the Ganges she had 10 feet of water in her Well, we continued by her during the night, Captain Harington expressing a desire in the Morning to return to her again. At 7am wore and stood towards her and at 9am Captain Harington left the St Vincent for the purpose of boarding her, but in his approach the ship he observed the Water running out of the scuttles on the Gun Deck the Forecastle being nearly under water and the Ship gradually sinking. He fortunately did not board her thinking it would be attended with imminent danger, in less than 10 minutes after this period she foundered and not a vestige remained in view of this unfortunate Ship. Longitude by Sun & Moon at half past 10am 19.50E. Lat 38.15S Long 20.42E (chr.). C&D ----. 68. Light breezes NbE very fair weather. Variously employed and making arrangements for the accommodation of the Passengers and Crew of the Hon Coys late Ship Ganges who amounted to 209 & with our own People 439 Souls. NB By the Chronometer we are 28 miles to the Westward of accounts and 23 miles to the South since yesterday. Went to allowance of Quantity of Water per man in consequence of the number of People on board. Lat ---- Long ----. Captain Bayliff of the Huddart recorded while at St Helena on Tuesday 6 June 1807 the following: "Arrived the Earl St Vincent with the crew and passengers on board belonging to the Ganges, which ship had become in so bad a state that it was found necessary to quit her. She sank in sight of the Earl St Vincent the day after her being quitted - no lives lost." Farrington, Anthony: "Catalogue of The East India Ship's Journals and Logs. 1600 - 1834". British Library 1999. Farrington, Anthony: "A Biographical Index of East India Company Maritime Officers 1600 - 1834". British Library. 1999. Huggins, W J: The Ganges, East Indiaman, in Bulletin of the Victoria Memorial Calcutta, 8 (1974) pp.21-23, illus.